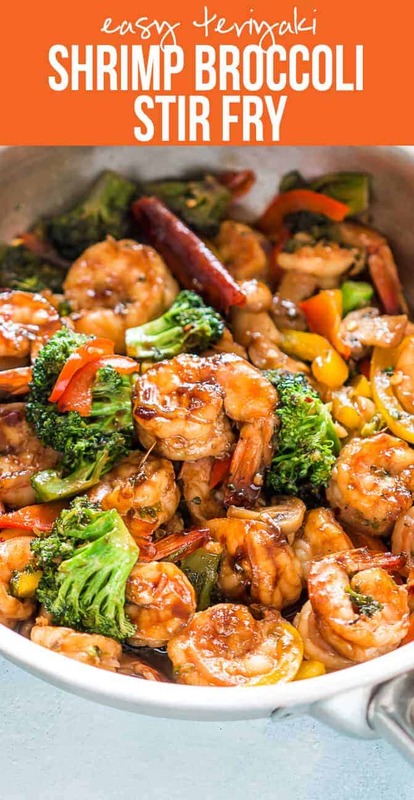 This teriyaki shrimp broccoli stir fry is ready in 30 minutes and is the perfect asian dinner when you want something quick and easy! 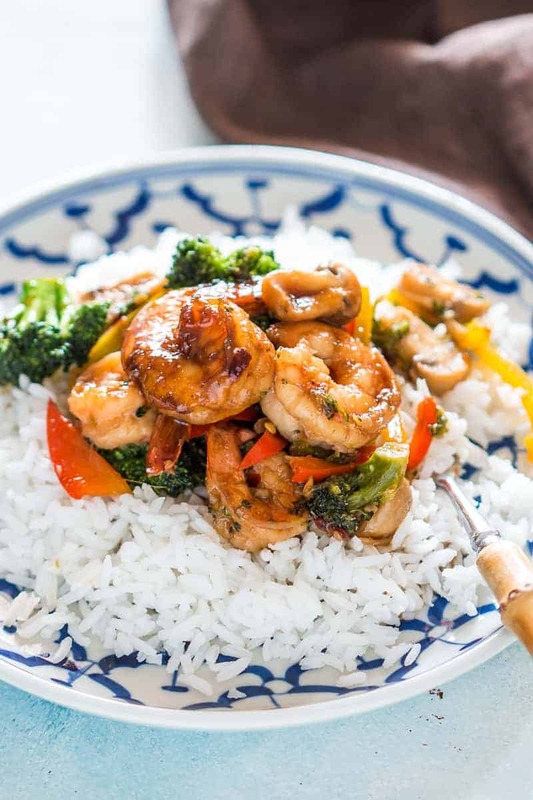 We are talking saucy, spicy and very easy teriyaki shrimp broccoli stir fry here. It’s what a girl makes when she has an empty fridge staring back at her and has a growling stomach for a reminder. I always have some frozen shrimp in the fridge and we eat so much broccoli in the house that we should actually be green. But no jokes today guys, because this is some serious 30 minute dinner recipe discussions. I know how much you love these easy, healthy and quick recipes and I’m always always wanting to bring you more. This is easily one of those which is soul satisfying and gives me more time for Netflix. Adding Amazon Prime to the list because we just got a subscription. Because one source of binge watching wasn’t enough. Don’t judge me my lazy bum but I can’t help falling down the spiral of episode 1 to 10 in a day anymore. I don’t even resist. I just succumb because it’s so much easier than trying to work and failing at it because you can’t stop thinking about what happens in the next episode. And then I realise that it’s 8 PM and I have no idea what I’m making for dinner. So I quickly dunk some frozen shrimp into water and hope that it thaws quickly, cut up some broccoli and every other vegetable I have lying around. Easy, teriyaki shrimp broccoli stir fry done. In other BIG news, I’m SEVEN days away from the clock striking 12 and turning 30. THIRTY did you say? I’m going to the darker side and the more exciting side of life, hopefully. But when did I get here so fast? Is this what 30 year olds do? Binge watch TV shows all day and then scramble to make dinner? Life still seems easy and fun and has all kinds of happy endings. Is 30 supposed to be feel old and miserable and responsible and when you have life in control? I’m going to ignore all these adult like feelings and pour some of that sauce on my rice and teriyaki shrimp broccoli stir fry. Because I need this more in my life right now. To take care of all the scary 30 year old feelings. Welcome to adulting. Mix together all the ingredients under sauce and set aside. Heat half the oil in a wok or pan, and add the chopped garlic. Saute for a minute and add shrimp. Stir fry the shrimp on high heat for 2-3 minutes till it starts turning pink. Add the broccoli and vegetables and stir fry again for 2-3 minutes. Once the shrimp is cooked through and the veggies start looking bright, add the sauce and keep stirring till it comes to a boil. Add a little more water if the sauce is too thick. Simmer for a minute or two. Check for seasoning and add salt if required. Stir well and switch off the flame. This recipe was easy and the flavors were amazing! This will be added to our rotation for sure. So glad you liked it Cathy! 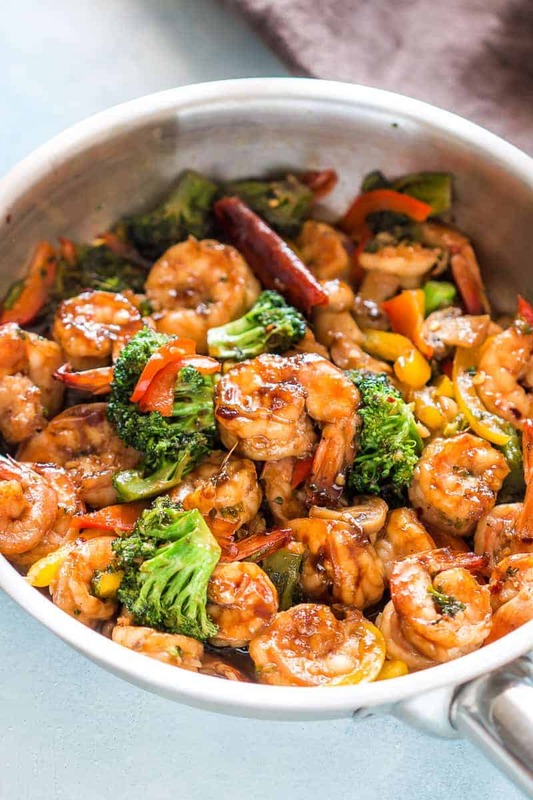 Legit speechless, that teriyaki shrimp broccoli stir recipe looks unreal! Definitely, I will make it on the weekend for my family. Thanks, Richa! It looks delicious but it seems to me little expensive. I will note your recipe in the cookbook and perhaps i will try recipe next birthday. Thx for sharing video and post! Sure Maira, I hope you give it a go! I made it for dinner and my husband loved it. I think next time I won’t put the hot stuff lol. It was good but my stomach didn’t think so. Ooops! We like our food hot, but reducing the spice won’t affect the taste. I hope you try it again. Are you using already cooked shrimp or fresh? Fresh or frozen shrimp – both work here. Frozen shrimp has to be thawed first. This is by far the exact stir fry recipe i’ve been looking for, simple ingredients and so tasty, substitute the honey for maple syrup used 1tbsp since i was out of honey and still delicious !!! Thanks Michelle!! So glad you enjoyed it! I was rather appealed at the price of raw shrimp so I grabbed a 1 lb SeaPak shrimp scampi. Put it in wok and sautéed the garlic in scampi sauce. Followed recipe except added only 1/4 cup water to sauce. Omitted honey. Came out fabulous! I used baby bells sliced mushrooms, broccoli florets, shredded carrot and canned water chestnuts. Hubby just loves it. So glad you liked it Vera! Thanks Susie! So glad you liked it! What is 500 grams of shrimp in lbs? ???? That’s about 1 lbs Lillian – googling it would’ve given you an answer faster! Love this resipe, so easy and the sauce was delicious. Easy, fast and oh so good. Could I use frozen broccoli? Where does the rice you show come in? Is there no teriyaki sauce? You can choose to serve it with steamed rice the way I do in the pictures. The stir fry has a bit of a sauce as a part of the process, but if you want more sauce, just add a bit of water or stock to increase the liquid while cooking. It looks delicious but it seems to me expensive. I will note your recipe in the cookbook and perhaps i will try recipe next birthday. Thx for sharing video and post! 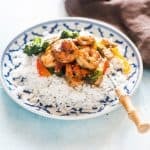 Stir fry is one of my go-to quick dinners too! Looks fabulous! I love all the ingredients in this dish. Looks like dinner! It looks really yummy and I found your post from Pinterest thanks for sharing.